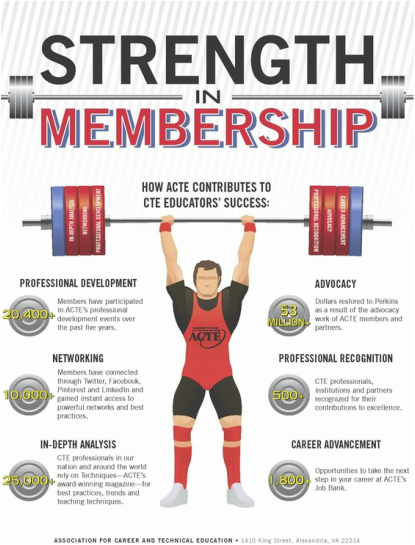 ADVOCACY – Through lobbying, coalition building, research and image awareness, Washington ACTE is focused on directing state and federal dollars and support to your classroom. PROFESSIONAL DEVELOPMENT – Affordable, quality professional development opportunities directed to the issues impacting you on a day-to-day basis. ANNUAL SUMMER CONFERENCE AND TRADE SHOW – The place where Career and Technical Education professionals go to explore new thinking, see new products, use new technologies, and network with colleagues. E-NEWS BLAST – An electronic newsletter meant to give you the latest and greatest news and information from around the organization and the CTE field. PROFESSIONAL RECOGNITION – You’re recognized for your dedication and outstanding service through Washington ACTE’s Awards Program.